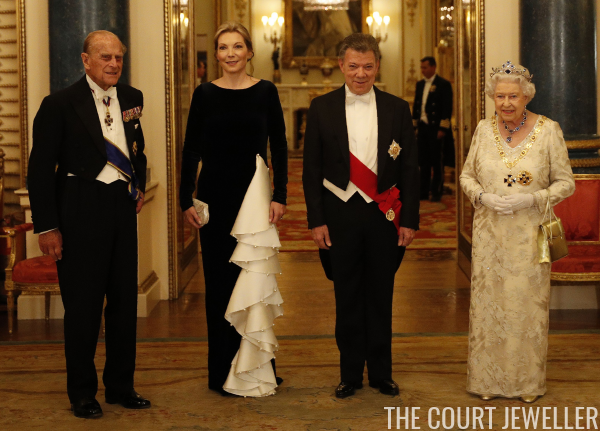 Today's state visit from Colombia to the United Kingdom continues with a lavish state banquet at Buckingham Palace. 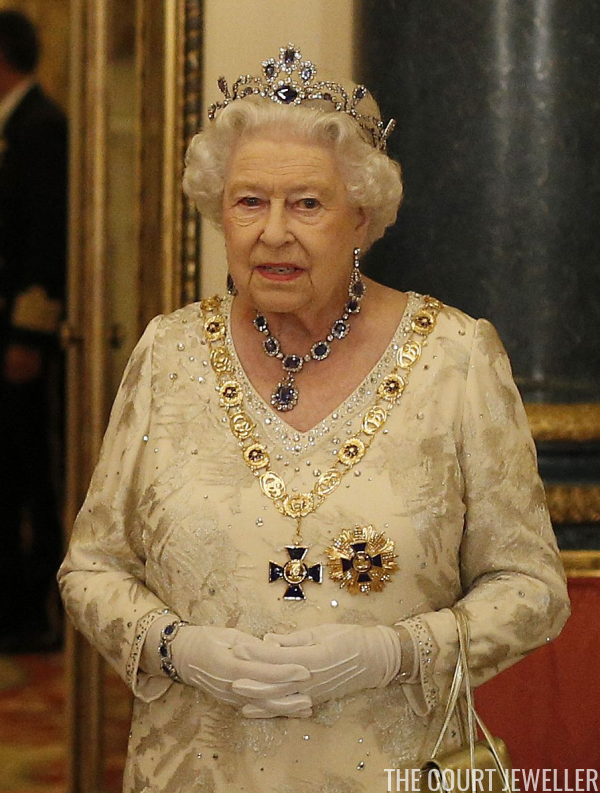 The Queen wore the same jewels she wore at the Buck House banquet last year for the Chinese president: the Belgian Sapphire Tiara with the suite of sapphire jewels she received from her father, King George VI. The tiara was originally a necklace worn by Princess Louise of Belgium; the Queen purchased the piece in the 1960s and has always worn it on a tiara frame. HM also wears the grand collar and star of her highest Colombian order: the Order of the Cross of Boyaca. She left off her two family orders (the George V and George VI). The Duchess of Cornwall was the second-highest-ranking royal lady at the banquet. She wore her standard gala jewels: the Greville Tiara and a multi-stranded pearl necklace with a diamond clasp. For a twist, she added the elaborate earrings from her suite of pear-shaped diamond jewels. A diamond bracelet glittered on her left wrist. Because Camilla doesn't have a Colombian order, she wore the sash and star her highest British order: the Royal Victorian Order. Queen Elizabeth II's family order was also pinned to her gown. The order of procession for tonight's banquet also included the Duchess of Gloucester and Princess Alexandra, but alas, no good photos of them available for me to use at the moment. I'll update that if things change! 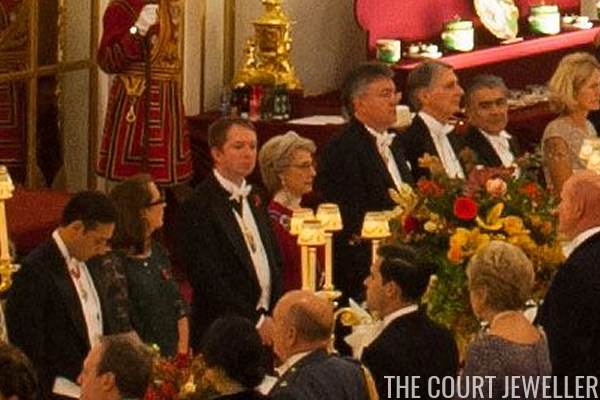 For now: you can see Alexandra wearing a tiara and her Garter sash in the background of the procession photo above. Update: We've got a (blurry) view of the Duchess of Gloucester! That's her in the middle of the photo, wearing a dark red dress and the sash of the RVO. I believe the silhouette of her tiara suggests that it's the Iveagh -- more's the pity, then, that we don't have a better view!